According to the SEER cancer statistics, 1,658,370 persons will develop new cancers in 2015 and 589,430 will die from cancer. Compared to this, the number of new primary brain tumors (BT), 22,850 or 1.4%, is relatively small. However, if one adds metastases from other cancers to the brain, the number of BT increases significantly. Primary BT will claim 15,320 lives in 2015, 2.6% of all cancer deaths. The incidence of BT shows a peak in childhood followed by a decline till 25 years. After this, there is a continuous increase with advancing age. Cancer is second only to accidents as a cause of death in children and adolescents, 1 to 19 years old. It causes 10.5% of all deaths. In that age group, BT, with an average annual age-adjusted incidence rate of 5.42 per 100,000, are the most frequent neoplasm, accounting for about 18% of all cancers. The second most common cancer in that age group is leukemia. The CNS is among the three leading sites of cancer mortality in the first three decades of life. The most frequent BT (all ages) is meningioma (35.6%) followed by glioblastoma (15.4%). 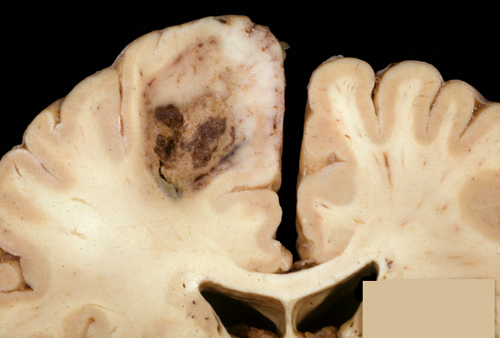 As in all cancers, the tumor cells of BT display some features of normal brain cells. This similarity may be obvious in the microscopic appearance and fine structure of tumor cells (especially in low-grade tumors) or revealed by their marker expression patterns, and is the basis of the classification of BT (see table below). This phenotypic-histologic classification has been in use for many decades and is also a histogenetic classification, i.e., it reflects our notions of the presumed cells of origin of BT. The term "glioma" refers to all glial tumors in general but is also used instead of astrocytoma. Extra-axial tumor. Sphenoid ridge meningioma. The terms "intra-axial" and "extra-axial," used in radiological descriptions, mean "in brain or spinal cord tissue" and "extrinsic to brain" respectively. For instance, astrocytoma and oligodendroglioma are intra-axial; meningioma and Schwannoma are extra-axial. 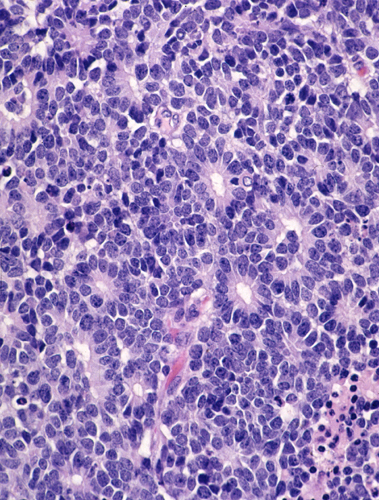 The term anaplasia describes the cellular atypia and loss of differentiation that are associated with malignant tumors. In adults, metastatic BT outnumber primary ones but are less frequently subjected to biopsy or studied at autopsy. Among primary BT, the most common ones are meningioma, glioblastoma, and astrocytoma. In children, primary BT are more common than metastatic, and the most frequent among them are pilocytic astrocytoma and medulloblastoma. The most common tumors of the spinal cord are Schwannoma, meningioma, and ependymoma. The majority of BT in children arise in the cerebellum and brainstem (infratentorial). Most BT in adults arise in the cerebrum (supratentorial). It had been assumed, until recently, that gliomas arise by transformation of normal glial cells. These cells were thought to be the only cells that had the capacity to divide, even though there is little evidence that they do so in the mature brain. This view is now being re-examined in the light of recent discoveries about neural stem cells (NSC), the multipotential precursors that give rise to neurons and glial cells. Until recently, NSCs were thought to be present mainly during fetal life, but it is now obvious that they also exist during post-natal life. They are more numerous and active during childhood, when the brain continues to develop, but are also found in the mature brain, especially around the ventricles, in the hippocampus, and in other locations. It is likely that gliomas and other tumors of neuroglial cells arise from NSCs. NSCs are capable of proliferation and divergent differentiation. The genes that are expressed in these BT, including Nestin, EGFR, PTEN, Hedgehog, and others (see also below) are the same ones that are involved in neurogenesis and gliogenesis. This suggests that aberrant activation of developmental genetic programs in NSCs gives rise to BT. Such activation results in emergence of transformed cells with an enhanced ability to proliferate and migrate. The NSC origin explains the higher incidence of gliomas and medulloblastoma in children, the fact that some BT are composed of immature cells, the inclusion of neurons in some BT, and the presence of multiple cell types within the same tumor, such as oligoastrocytoma. The ultimate expression of multipotentiality is the development, in the brain, of teratomas, i.e., tumors containing derivatives of all 3 germ layers, similar to tumors arising in the gonads. Some of the genes that are involved in neoplasia-oncogenes- promote cell growth and others –tumor suppressor genes-have the opposite action. Oncogenes code for growth factors, growth factor receptors, cytoplasmic signal transduction molecules, and nuclear transcription factors. When these proteins are inappropriately or excessively expressed (due to gene amplification, translocation, mutation, and other mechanisms), cells change their phenotypes and gain functions (such as moving through the extracellular matrix, inducing angiogenesis) that enhance their ability to survive, compared to their normal neighbors. The proteins of tumor suppressor genes, together with other catalytic and inhibitory factors, regulate the cell cycle and restrain cell proliferation. Loss of both copies of tumor suppressor genes (from mutation, chromosomal deletion, aberrant methylation, and other mechanisms) leads to unrestrained cell proliferation. Such mutation or deletion may result from acquired (environmental) damage of one allele, then the other. Individuals who have one defective allele of a tumor suppressor gene in their germline tend to develop tumors at a young age, and this trait is transmitted to their children. The best known tumor suppressor genes are the retinoblastoma (Rb) gene on chromosome 13q, and p53 gene on 17p. Both these tumor suppressor genes are involved in the pathogenesis of BT. The genetic changes that are involved in BT are briefly outlined in the following descriptions of each individual BT. The mainstay in the diagnosis and classification of BT is still their microscopic phenotype. However, molecular alterations are progressively taken into account and provide information that is crucial for diagnosis, prognosis, and, more important, for management of BT. Information about molecular changes can be obtained by various genetic testing methods and immunohistochemistry. BT are initially derived from a single progenitor, but later, the genetic instability that is associated with rapid cell replication causes molecular and chromosomal changes to snowball, generating multiple tumor cell clones. This adds to the phenotypic heterogeneity and is reflected in the karyotypes and gene expression patterns of BT. Chromosome and molecular analysis are very important in the laboratory investigation of BT. Clues about the biology of BT revealed by such studies may be used to design chemotherapy that disrupts signaling pathways that cause BT to grow out of control. Listed below are certain familial disorders that are associated with an increased risk of CNS tumors. Together, these and other familial tumor syndromes account for a small proportion (between 1% and 4%) of BT. 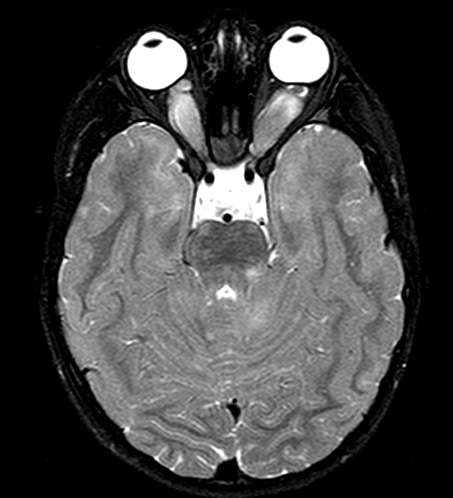 Bilateral optic nerve astrocytoma in a patient with NF1. Note thickening of the optic nerves. 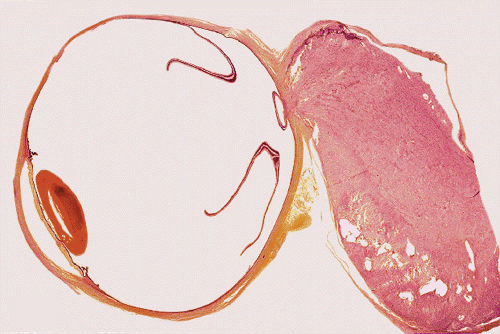 Astrocytoma of the optic nerve. Von Recklinghausen neurofibromatosis (VRNF - Neurofibromatosis type 1-NF1), one of the most common genetic disorders, is autosomal dominant and is caused by mutations of a gene on chromosome 17q that encodes a protein called neurofibromin, which is involved in control of cell proliferation and acts as a tumor supressor. Patients with VRNF have a variety of tumors, including bilateral optic nerve astrocytomas, and plexiform neurofibromas and MPNSTs. VRNF also causes café au lait spots of the skin, axillary and inguinal freckles, dysplasia of the sphenoid wing and other skeletal abnormalities, fibromuscular dysplasia of arteries, and other lesions. 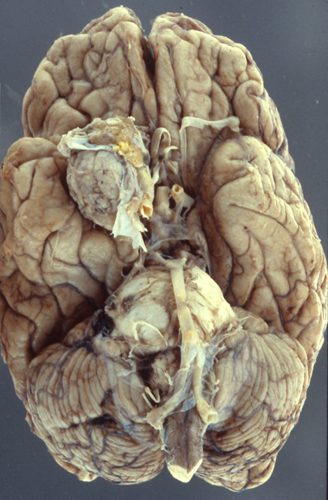 Bilateral acoustic neurofibromatosis (BANF - Neurofibromatosis type 2-NF2) is an autosomal dominant condition characterized by acoustic and spinal schwannomas, meningiomas, ependymomas and lenticular opacities. It is due to inactivation of the NF2 gene on chromosome 22q. This gene encodes a structural protein, schwannomin or merlin, which has tumor suppressor activity. Tuberous sclerosis. Subependymal nodule. 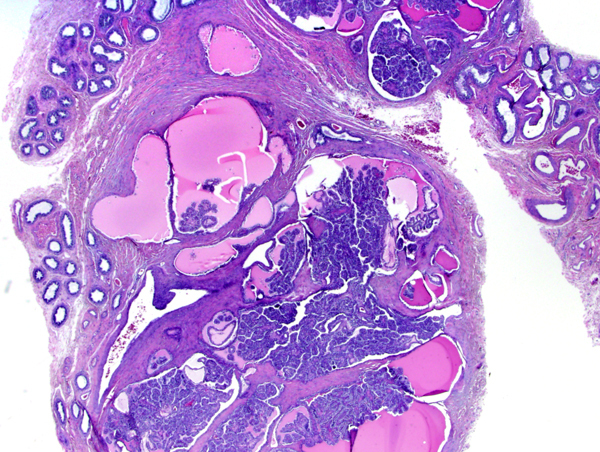 Similar histology to SEGA with frequent calcification. Image provided by Dr Maie Herrick. Tuberous sclerosis. Subependymal giant cell astrocytoma at the foramen of Monro and cortical lesions. Tuberous sclerosis. Subependymal giant cell astrocytoma. Tuberous sclerosis. 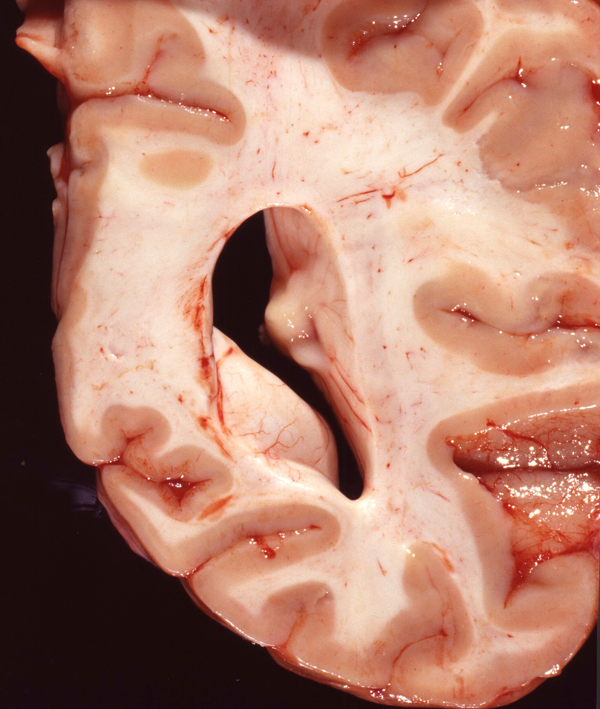 Cortical lesions (tubers). 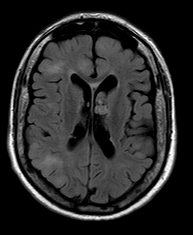 The lesions are firm, and cortical/white matter demarcation is lost. Compare to adjacent normal cortex. Image provided by Dr Maie Herrick. Tuberous Sclerosis Complex (TSC) is an autosomal dominant condition that affects the brain, skin, kidneys, lungs, heart, and other organs. It is characterized by several major and minor features that are used as diagnostic criteria. Major features are cortical tubers, subependymal nodules, subependymal giant cell astrocytomas (SEGA), hypomelanotic skin macules, shagreen patches, retinal nodular hamartomas, ungual or periungual fibromas, cardiac rhabdomyomas, pulmonary lymphangiomyomatosis, and renal angiomyolipomas. Minor features include dental pits, intraoral fibromas, multiple renal cysts, “confetti” (hypopigmented) skin lesions, nonrenal hamartomas, and retinal achromatic patches. The diagnosis of TSC can be established if 2 major or one major and 2 minor criteria are present. TSC patients have seizures, intellectual disability, ADHD, and other neuropsychiatric disorders. The cortical tubers are abnormal, broad (potato-like), firm gyri. They represent focal malformations of cortical development, similar to some forms of cortical dysplasia, and have an abnormal cytoarchitecture which includes large, often bizarre pyramidal cells in a background of gliosis. Tubers are epileptogenic. The SEGAs consist of variable size, often large or giant astrocytes and have frequent calcifications. Despite their cellular atypia, they are slowly growing tumors but can cause hydrocephalus because they are located at the foramina of Monro. Tuberous sclerosis. 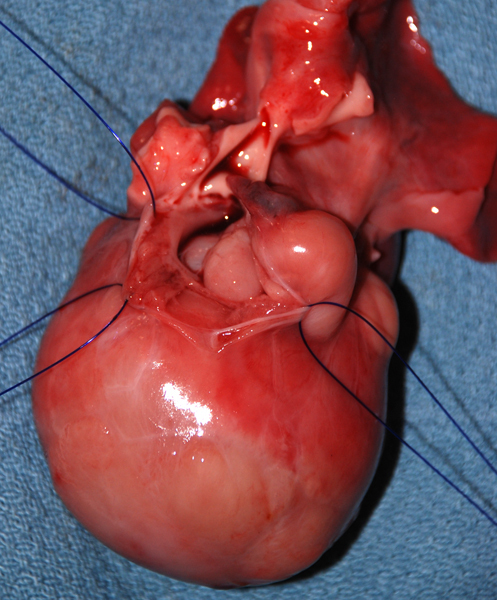 Cardiac rhabdomyoma. The tumor cells have a large amount of cytoplasmic glycogen which dissolves creating the clear or spider-like appearance. TSC is caused by mutations of two genes, TSC1 on 9q34 which encodes hamartin and TSC2 on 16p13.3 which encodes tuberin. Hamartin and tuberin form a functional complex which suppresses the activity of the mammalian Target Of Rapamycin (mTOR), a serine/threonine kinase that plays a central role in multiple processes involved in brain development, including neuronal proliferation, neuronal growth, and axon formation. Rapamycin is an antibiotic, antifungal and immunosuppressant. It is also a potent antagonist of mTOR. Overactivatin of mTOR signaling (caused by mutations of TSC1 and TSC2 and other regulatory proteins) leads to cortical malformations, including tubers, focal cortical dysplasia type IIb, ganglioglioma, and hemimegalencephaly. The latter is a mosaic disorder with mTOR hyperactivation present in one hemisphere. mTOR hyperactivation is evident in pathological specimens from these disorders, which have been grouped under the umbrella term "mTORopathy". The key features of mTORopathies are abnormal cortical cytoarchitecture, abnormal cells (dysplastic neurons and balloon cells), intractable seizures, and cognitive abnormalities. mTOR overactivation has also been demonstrated in Neurofibromatosis 1, Sturge-Weber syndrome, Cowden syndrome, PMSE (Polyhydramnios, Megalencephaly, Symptomatic Epilepsy), and Proteus syndrome. Treatment with mTOR inhibitors (Rapamycin, Everolimus) causes regression of SEGAs and other TSC lesions. 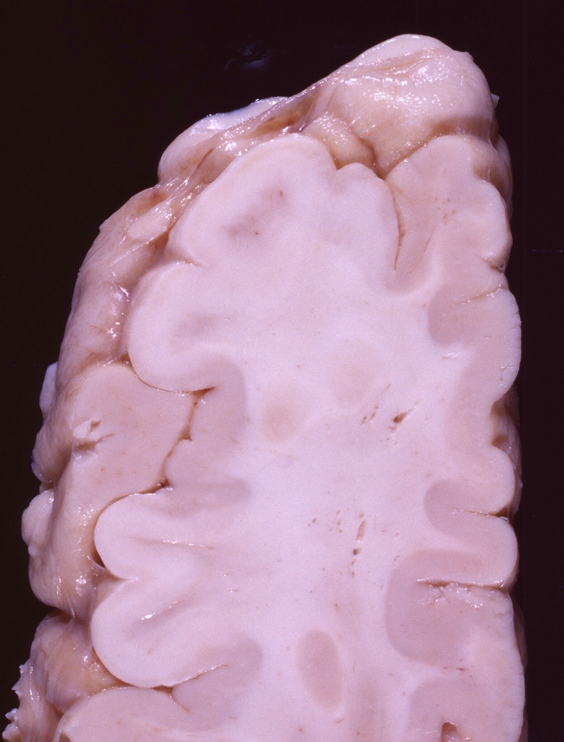 Capillary hemangioblastoma of the cerebellum. Collapsed capillaries and interspersed foamy stromal cells. Papillary cystadenoma of the epididymis. One of the less frequent lesions of VHL. Von Von Hippel-Lindau (VHL) disease is an autosomal dominant disease, caused by mutations of the VHL tumor suppressor gene on chromosome 3p25.3. The product of this gene is involved in mRNA transcription and multiple other functions. VHL disease is associated with hemangioblastomas of the cerebellum, retina and spinal cord, cysts and clear cell carcinomas of the kidneys, pheochromocytomas, cysts of the liver and pancreas, pancreatic tumors, epididymis cysts, cystadenomas of the broad ligament and endolymphatic sac tumors of the middle ear. Hemangioblastoma of the cerebellum is usually a cystic lesion with a protruding nodule which is composed of capillaries and interspersed clear cells. 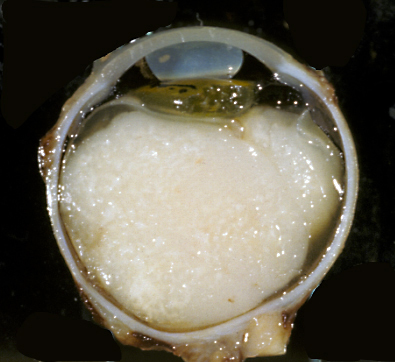 Retinoblastoma filling the vitreous cavity. Retinoblastoma: a small blue cell tumor with Flexner-Wintersteiner rosettes. Retinoblastoma. Retinoblastoma is a malignant embryonal tumor of the eye similar to medulloblastoma. 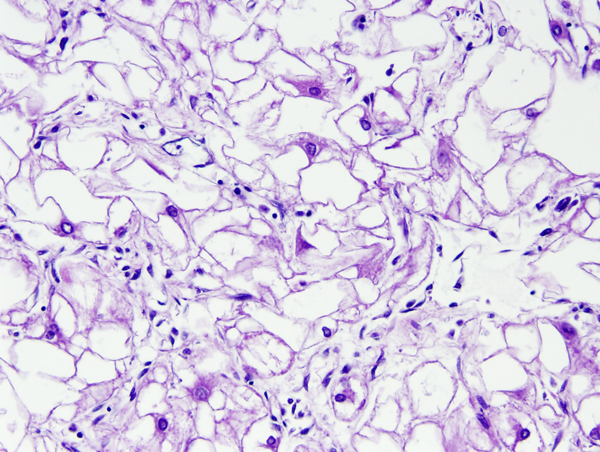 It is composed of “small blue cells”, which are frequently arranged in characteristic circular formations, the Flexner-Wintersteiner rosettes. Eighty five percent of retinoblastomas are sporadic. Fifteen percent are autosomal dominant and are often bilateral and multiple. Tumor development is due to deletion of the Rb tumor suppressor gene on chromosome 13q14. Familial tumors have a germline mutation resulting in one defective copy of the gene. Tumors develop when the remaining normal copy is altered due to a somatic mutation. The same principle is involved in the pathogenesis of other tumors. Age: Embryonal tumors of the brain and other organs (cerebellar medulloblastoma, adrenal neuroblastoma, occur predominantly in children. Neurogenesis and neuronal migration in the cerebrum are largely completed by midgestation, but in the cerebellum they continue for the first year of life. Production of glial cells is very active in childhood. The brisk cell division that is associated with these processes gives the chance for new gene defects to emerge and for inherited ones to be unmasked. The cerebellum is the most cellular part of the CNS (granular neurons outnumber all other neurons in the brain together) and takes the longest to develop. It is no coincidence that it is the most frequent site of BT in children. Radiation: An increased incidence of BT, especially meningiomas, has been reported in patients who have received radiation to the head (even low-dose radiation) for a variety of reasons. Children with ALL who have been treated with craniospinal radiation are at high risk for developing meningiomas and gliomas. These tumors emerge many years after radiation has been given and appear to be on the rise. Chemical Carcinogens: A variety of substances can induce mesenchymal and glial CNS tumors in animals by direct intracerebral inoculation and by oral and parenteral administration. The most potent neurocarcinogens in experimental animals are nitroso compounds (NOCs). NOCs are present in foods (cured meats, fish, vegetables), cosmetics, rubber products, even in beer and water, and are also synthesized in the mouth, stomach, and bladder by nitrosation of amines and amides in the diet. Given their ubiquitous nature, it is likely that they are also involved in human BT. Immunosuppression: Cerebral lymphoma, usually B-cell, is frequent in patients with AIDS, renal transplants, congenital immunodeficiency syndromes, and other immunosupressed states. The finding of EBV DNA suggests that some of these tumors arise from EBV-infected B-cells. High proliferative index in retinoblastoma. 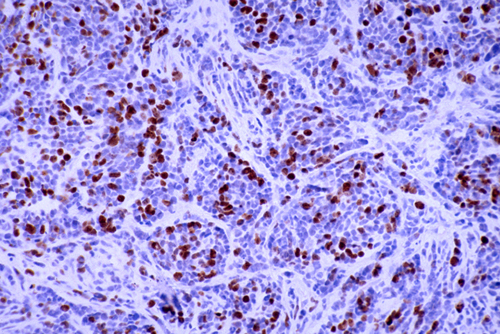 The Ki67 immunostain identifies a nuclear protein that is expressed in actively dividing cells. The laboratory evaluation of BT entails a pathological diagnosis, based on their microscopic and immunohistochemial features, and an assessment of their clinical behavior (grade). 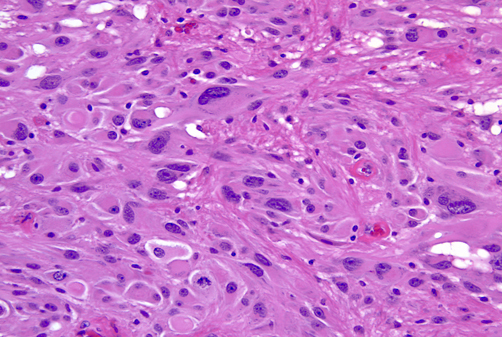 Histological grading is based on cellularity, cellular and nuclear atypia (anaplasia), proliferative index, necrosis, and other features. 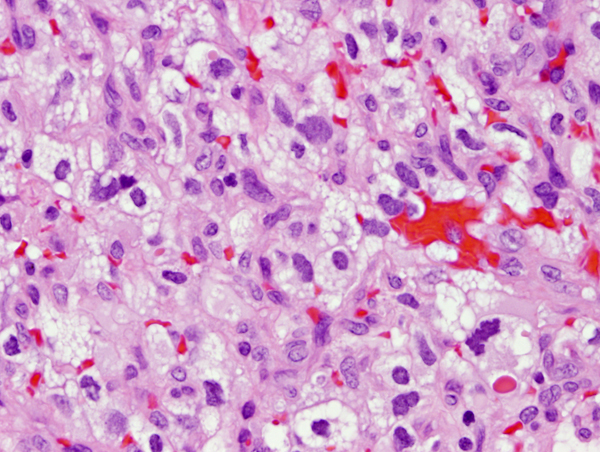 The simplest proliferative index is a count of mitoses. More elaborate evaluations use the Mib-1 antibody raised against the Ki-67 antigen which is expressed during all phases of the cell cycle except the G0 phase. Information about the labeling index (LI) of BT has been published and it is a useful prognostic measure.Molecular analysis also plays an important role for diagnosis and for designing a biological approach to treatment. Immunohistochemistry can now be used to reveal molecular changes underlying BT. Genetic testing can also be performed on paraffin-embedded tissue. However, it is a good practice to also set aside frozen tissue for molecular testing, if adequate samples are available.